Risotto, prized for its creamy texture and rich taste, is a staple of Northern Italian cooking that is typically served in smaller portions as the first course, or primi piatti. While risotto may have an intimidating reputation because of the attention it requires, risotto is easy to prepare and never fails to impress. No easy risotto-cooking hacks needed here, just follow the steps below and you’ll soon become a risotto master. Arborio is shorter and fatter than Carnaroli. The most widely available risotto rice, Arborio has less starch content than Carnaroli which means it’s easier to overcook. Carnaroli is firmer in texture and slightly longer than Arborio. 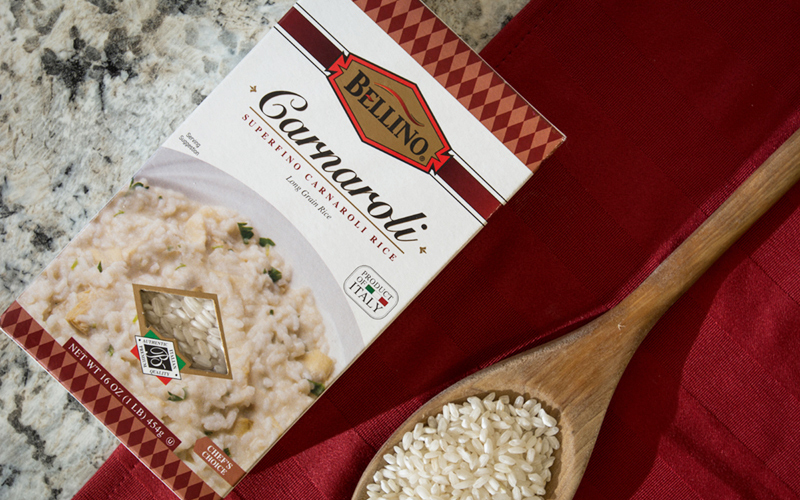 Often referred to as the “king” of Italian rice, Carnaroli is more resistant to overcooking and therefore more forgiving. Use the six steps below as a base for risotto recipes, then customize each dish to your liking with the addition of your favorite ingredients, seasonings and flavors. Once you master the basics, the possibilities and flavor combinations are endless. Before beginning the steps below, first gather and prep your ingredients. Then, bring a large pot of stock to a boil, immediately reducing to a simmer until needed. The first step in making risotto, soffritto refers to creating a base of flavors for the risotto. Depending on preference and your recipe, the ingredients in this step are aromatics such as onion, shallots, celery, carrots, garlic and herbs. 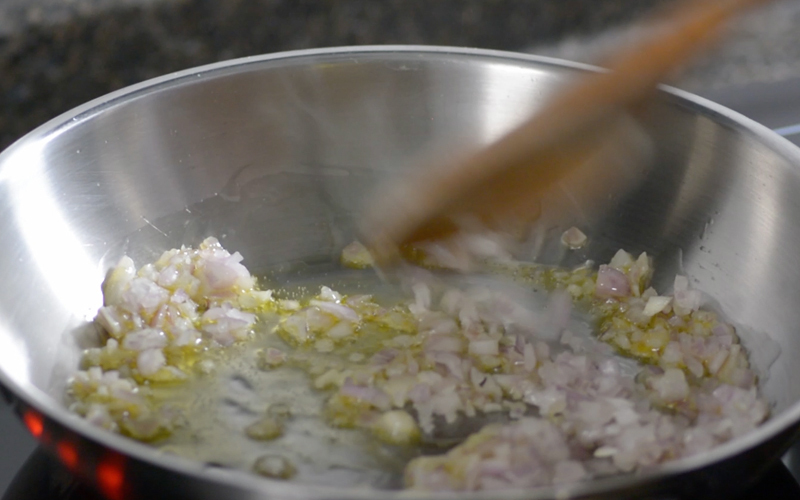 Sauté aromatics over a low flame until softened, but not burnt, in butter, olive oil, or a mix of the two. They key to il soffritto is chopping the aromatics as finely as possible to ensure they blend smoothly into the rice, not stand out as large pieces. 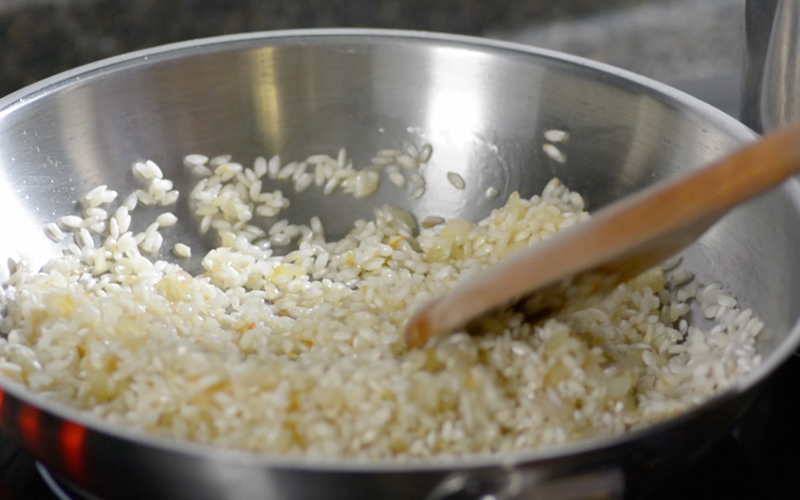 Once the soffritto has softened, the second step of risotto is toasting the rice to add a base of flavor to the grain. Turn the flame to medium, add rice to the pot, and sauté for 2-3 minutes to remove moisture from the grains and coat with flavors from the soffritto. Stir constantly to avoid sticking and burning. This step adds more flavor to the grains, usually in the form of white wine or another acidic liquid, and deglazes the pan. Although this step isn’t always necessary, the added acidity provides another depth of flavor in the dish. Sfumato means to smoke or make steam, and once you add the wine, a puff of steam will come out of the pan. When it settles and the alcohol cooks off, you’re ready for the next step. La cottura refers to the actual cooking of the grains by slowly introducing liquid to the pan. The key to this step is adding hot stock, one ladle at a time, and cooking until almost fully absorbed before adding more stock and repeating until the rice is fully cooked. Frequent stirring will ensure the rice is cooked evenly, but over-stirring will add too much air and cause the rice to cool. Over a medium-low flame to control cooking, continue adding stock in ½-1 cup increments until rice is al dente, about 15-20 minutes. Begin testing grains for doneness after about 10 minutes of cooking. 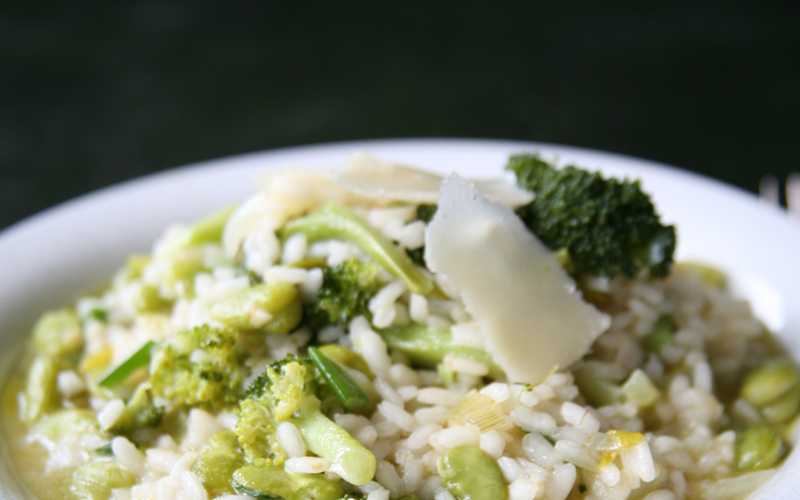 If the risotto is crunchy, it isn’t fully cooked and if mushy, it’s overcooked. Resting the risotto is important, as this helps lower the temperature for the final stage which is the addition of fat and other ingredients. Remove the pot completely from heat, cover and let rest for 2-5 minutes. La mantecatura is everyone’s favorite stage because you add more flavor and creaminess to the risotto though the addition of butter, cheese or oil. 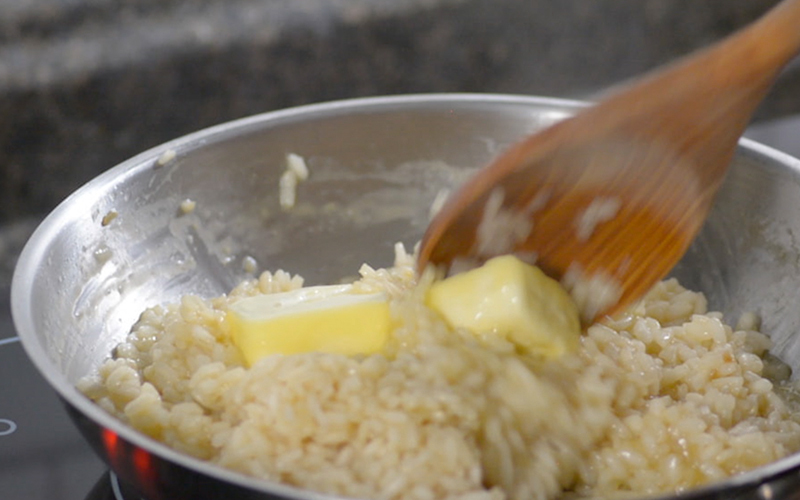 Grab your rested risotto and cold butter or cheese, gently stirring until melted and evenly distributed. If the consistency of your risotto is too thick, add small increments of broth or hot water and mix until desired consistency is reached. Serve immediately, as the starches will set and your risotto will lose its smooth consistency if left out. Have your ingredients prepped and stock heated before you begin. 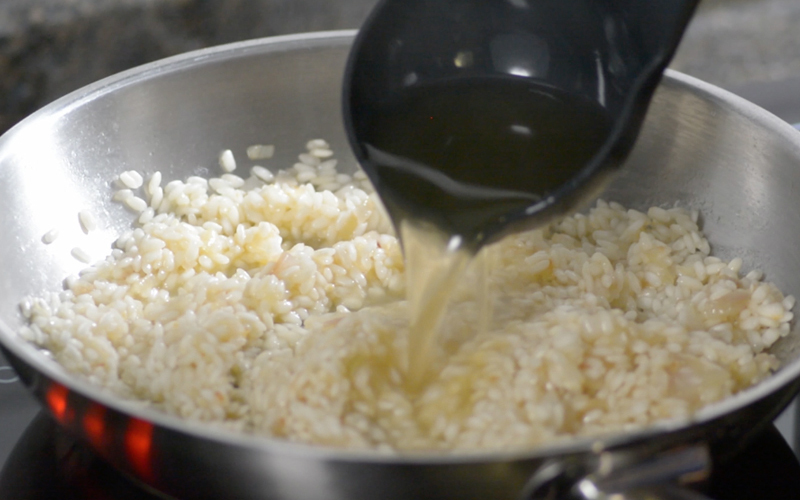 Risotto won’t wait for you once you begin the cooking process! 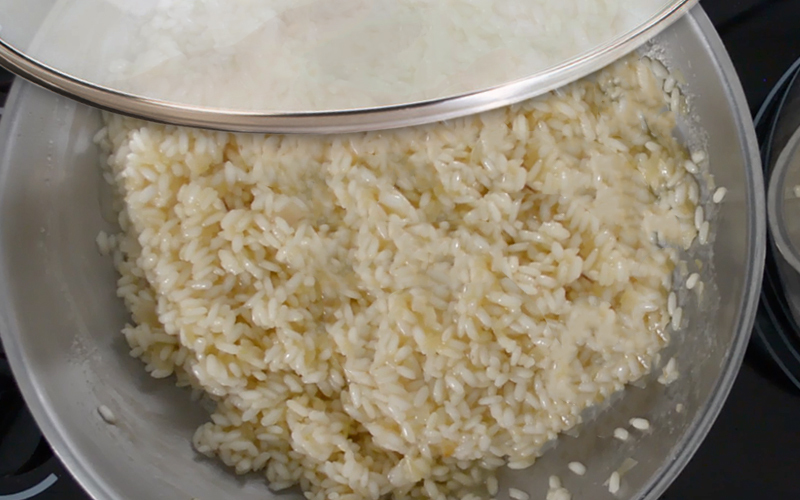 Choose the right tools: risotto should be made in large, heavy bottomed pot that maintains and distributes heat well. A wide pan with a thick base is best, just make sure the sides are high enough to hold the broth. You’ll also need a wooden spatula, a ladle, and another pot in which to heat the stock. Premium quality stock is key! The flavor in your risotto comes mainly from the stock you use, so make sure you are using a stock that is full in flavor and lower in sodium. To heat your stock, first let it reach a boil then reduce to a simmer until needed. If you need to double or cut a recipe in half, remember that the ratio of raw rice to stock is 1:2, or 1:2 ½. You should have at least double the amount of stock as you do rice. Don’t reheat your risotto! Reheated risotto will become chewy or dry and never retain the texture that makes risotto so appealing. Instead, transform your leftover risotto into arancini with Lidia’s Rice Ball recipe. Don’t be a victim of under- or over-stirring! 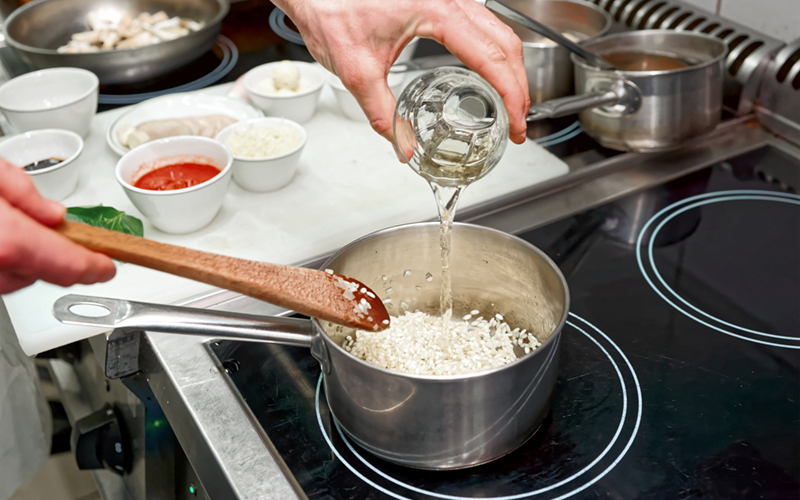 Over-stirring will cause too much air to enter the risotto, cooling down the rice and slowing the cooking process, and under-stirring will allow for sticking to the pan and burning. If adding vegetables to your risotto, either cook them in a separate pan, or cook them in the pot you’ll use to make risotto, then remove and set aside. Never let your risotto get dry! There should always be a small amount of liquid left in the pot. To tell if your risotto is ready for more stock during la cottura, run your wooden spoon across the bottom of the pot. If there’s little to no liquid, it’s time to add more. 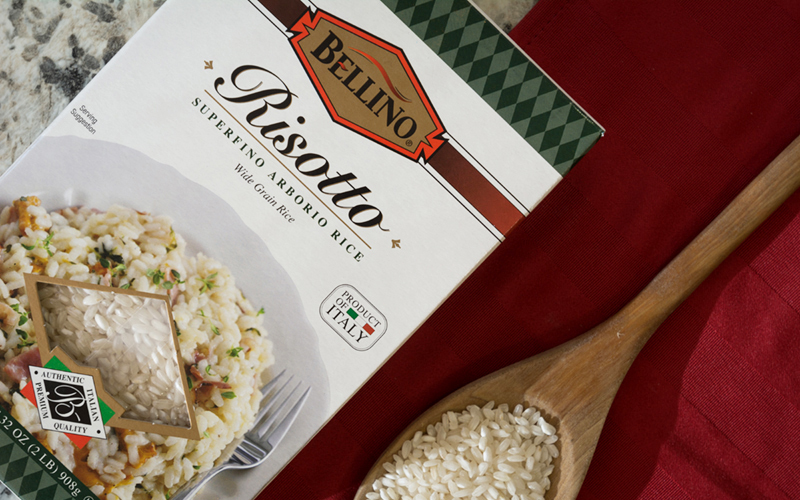 Bellino Risotto Arborio Rice, a product of Italy, is made from 100% arborio wide grain rice. Pair with vegetables or shrimp for a delicious entrée, our Arborio rice is freshly vacuumed packed to preserve flavor. Carnaroli is considered the best Italian rice by chefs around the world and is perfect for risotto, salads and gourmet special occasions. 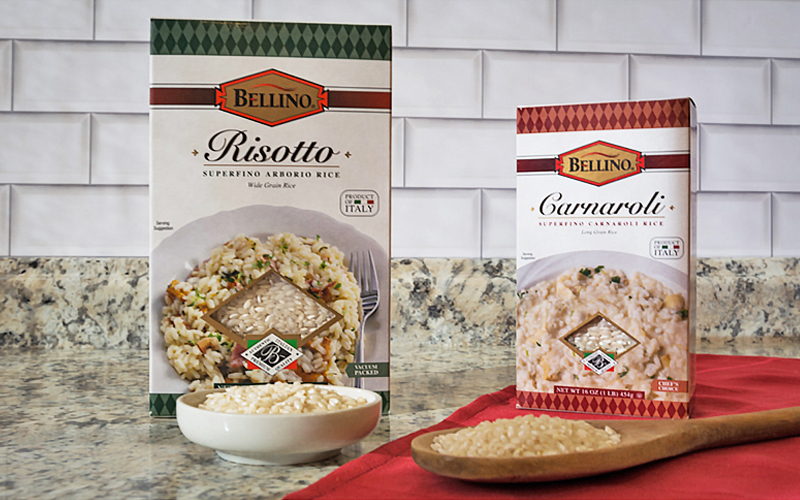 Vacuum packed to maintain the quality of the rice as a product of Italy, Bellino Carnaroli stays al dente and mixes well with a variety of ingredients.